As a 20 year old on break from university I spent the summer holidays traveling in India with friends. Almost on a par with the native interests of India were the Israelis we met there who made a profound impression on us. My first piece ever published in the Jewish Chronicle, way back in 2007 and then, to my surprise, picked up and translated by a German newspaper, the Jüdische Allgemeine. Having spent the last 4 years living in Israel as well as having traveled again in India, I’m not sure I would write the piece in the same way, but many of the same questions that we first framed there still resonate strongly today. 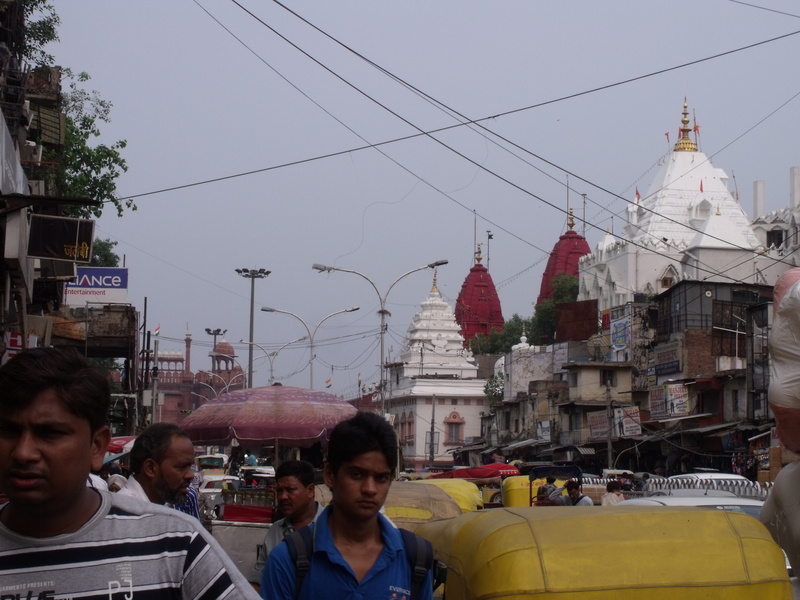 Paharganj, Delhi, our first day in India. Bombarded from all sides by pungent smells, loud shouts, touts advertising their brother’s hotel, and cows pulling fruit wagons, one sign catches our attention. No, it is not Bollywood; rather it is a large smiling photo of the Lubavitcher Rebbe welcoming Israelis to the Chabad House, Delhi. We were four Jewish university students from Leeds and North-West London, veterans of years of Jewish day school, Bnei Akiva and gap schemes in Israel. We had chosen to visit India in the hope of opening our eyes to new vistas and a foreign culture. As it turned out, much of our holiday was spent grappling with a subject we had expected to leave behind: Israelis and Judaism. Israelis, we had been constantly told during our years of Jewish education, were the ideal Jews. Only in Israel was it possible to live a Jewish way of life, observing the festivals in their correct context, serving in the army whose mission is to protect the Jewish people. The upright and proud Israeli towered over the feeble diaspora Jew who, if he was not being persecuted by gentile society, was assimilating into it. It is well known that Israelis like to travel, but there is something unique to the phenomenon of Israelis in India, where, in certain parts of the country, even the road signs are written in Hebrew. Frustrated with years of obeying orders in the army, they arrive in India to enjoy absolute freedom. Military fatigues turn into robes and, where once not more than a millimetre of hair grew, flowing locks and tangled beards become the order of the day. The mystical lure of India’s ancient culture and religion is highly attractive to young Israelis who find little to excite and inspire them at home. Our first Shabbat was spent in Varanasi on the banks of the Ganges. Having gained permission to light our candles in the hotel window, we settled down to enjoy a Friday night meal thousands of miles from home. The hotel was on a busy street, and within half an hour, six Israelis were sitting around the table with us. A girl in full sari, when asked where she lived, replied haughtily, “Ani lo gara” (“I do not live”). She was above being tied down to any specific place. She was an Israeli in India who could come and go whenever she pleased, without the need to forge roots or pledge commitment to any given place. Yet for all their confidence, they were attracted to our Friday night meal which reminded them of times gone by. The next week we found ourselves in a village called Bhagsu, in the foothills of the Himalayas. Together with some 80 Israelis, on an open balcony overlooking snow capped mountains, we began to sing Shalom Aleichem, the traditional song before beginning the Friday night meal. A long-haired Israeli named Adam turned to me and mentioned how nice the atmosphere was. Did I know, he asked, that he had only heardShalom Aleichem for the first time while in India? Over the months spent at Friday night tables around the country, he had learnt to appreciate it as “something which binds Jews across the world… like one big family”. Adam summed up the true paradox of Israelis in India. Arriving with little of which they are consciously proud, religion is for them simply a synonym for unwanted coercion. Adam had never thought of having a Friday night meal until he came to India. All Judaism had meant for him was rabbis forbidding one thing after another. This fitted into the context of living in a country with corrupt politicians, a horrific security situation and glaring social inequalities. In short, Adam and thousands like him are Israeli, they told us, simply because they are born there, and not because anything positive makes them want to define themselves as such. All this changes in India. Confronted by a culture that is completely alien to theirs, if they wish to maintain any sort of link to Israel and Judaism, they must do something active about it. Into this vacuum, appear groups such as Chabad and Lev Yehudi, which are all too happy to give the ex-paratroopers and Sbarro waiters (an Israeli pizza chain) their first taste of traditional Judaism. A few verses later, Adam started laughing. Why? Because his girlfriend sitting opposite us was also singing Shalom Aleichem. Why was that funny? Was he already worried about the rabbinic injunction against hearing a woman’s voice? No, it was funny because his girlfriend was not Jewish. She was a charming Catholic New Yorker he had met in India. Having been dragged to many Friday night meals, it had become second nature for her to sing Shalom Aleichem. So what does Adam, and thousands of other young Israelis like him, do now? He has had a glimpse into a life of meaningful Judaism that is too powerful for him to walk away from. He told us that although he cannot imagine his children wearing kippot, he would hate to deprive them of the opportunity of knowing what a traditional Friday night is. His was a dilemma, the answer to which is of crucial relevance to the identity of the state of Israel and the character of the Jewish people. The failure of secular Zionism to provide a positive identity for a generation which no longer needs to fight the British or drain swamps means that, paradoxically, the Israeli youth of today who journey thousands of miles to discover the secrets of the Orient, find that what they are looking for has been in their own heritage and tradition for thousands of years. Whether Adam and those like him will make the return journey back to Israel remains to be seen.